I’ve been a very bad blogger. It hit me, when I was, wait for it, SNOWBOARDING the other day, that I haven’t been blogging in ages! I can’t exactly figure out why I was thinking about blogging at that point, but – sometimes there’s no explaining these things. Anyways, I’ve been a busy little baker for sure, but blogging hasn’t really been something I’ve been paying attention to! This is like catch-up, I hope you enjoy this little snapshot of my recent adventures. Let’s get something clear, I am a master in the kitchen and oddly deft with my fine motor skills, but coordination hasn’t always been my strong suit; I’m talking walking into walls and hitting corners of the island because I misjudge my 5″0″ frame. So to clarify, snowboarding for me, consisted of successfully getting down the mountain (read: green/beginner trail) only twice, halfway back up once, having a seriously bruised backside now 3 days and counting, accompanied by a small almost-panic attack. Halfway up once, you ask? Here’s the story – all of my belongings which I smartly put into a zip-lock plastic baggie to protect from water, fell out of my jacket pocket as I was tumbling down the mountain in attempt to remain upright. It seems smart to keep everything together, right? But when you reach into your pocket to realize that lovely combination of credit cards, debit cards, ID, cellphone, and CHAPSTICK, are missing, I started to question my logic. So, commence walking halfway back up the mountain. By the grace of I-don’t-know-what, some genuinely good person found my belongings as they were heading down, called Kyle’s number, and returned it to me! Evidently a similar situation happened to them previously they paid-it-forward. Lucky me indeed! As a side note, for my first time snowboarding for a less than coordinated 5-foot nothing chump, I think i did really great! 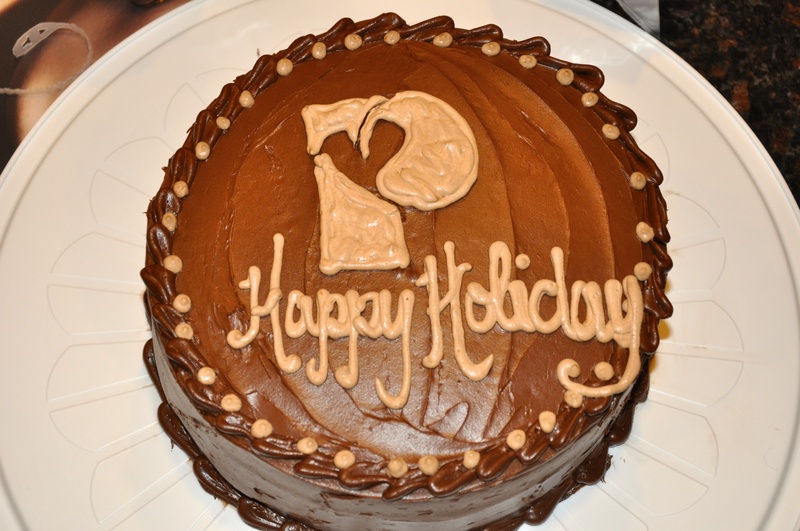 Backing it up to a few weeks ago, my work holiday party, I made a chocolate cake (surprise surprise) with… drum roll please? 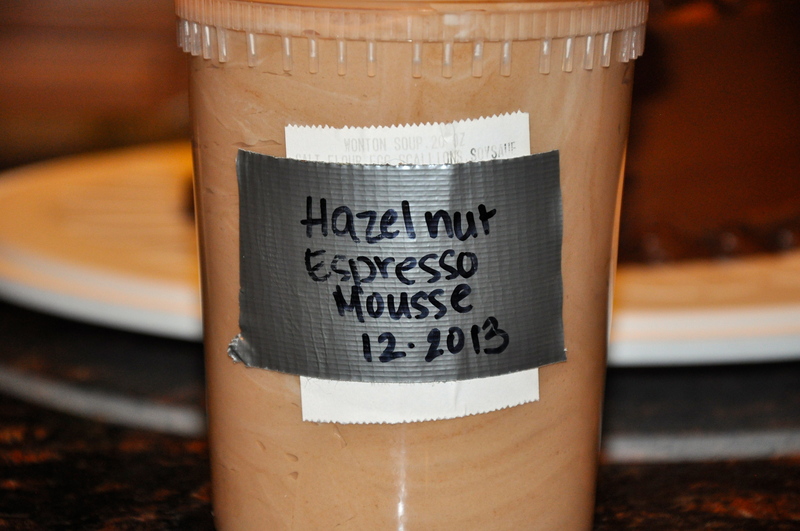 Hazelnut-espresso mocha mousse. 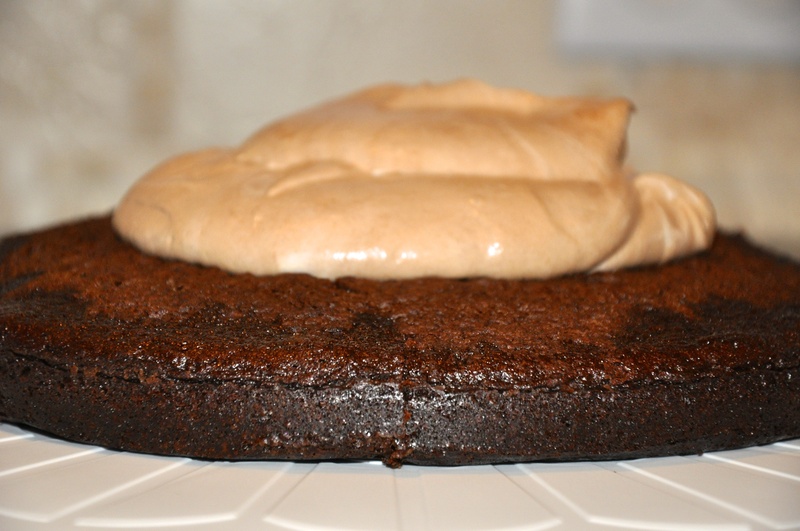 As in, basically Nutella plus whipped cream inside a chocolate cake. If that doesn’t interest you, then you can just eat plain vanilla cupcakes, because really, thats a punishment in and of itself. Super simple idea for the filling, basically whip up whipped cream and fold in the Nutella and – because we can – a dash of Kahlua. Voilà! Mix the Nutella and Kahlua/water mixture until smooth, set aside. 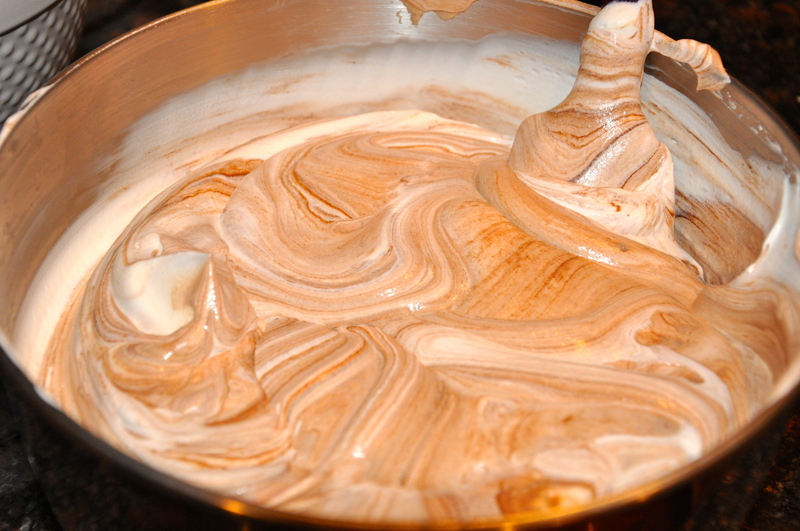 Whip whipping cream until stiff peaks form; fold in Nutella mixture until combined. 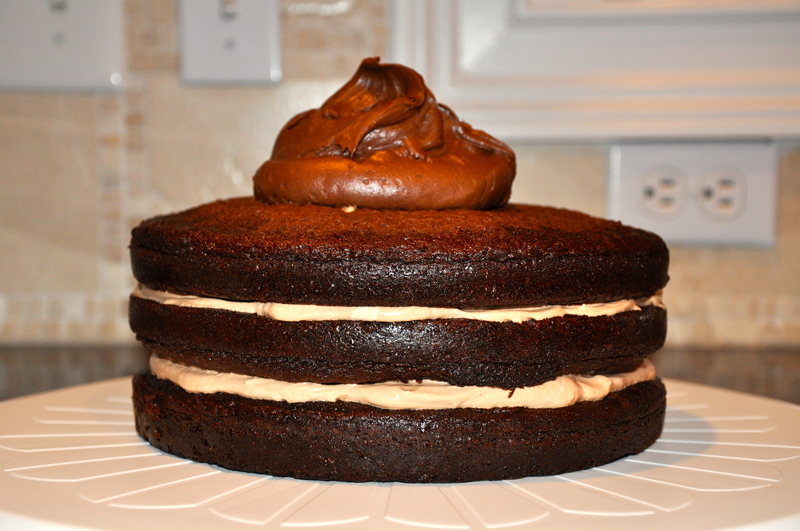 For the cake itself, I used my favorite 3 layer chocolate cake that I stole from this phenomenal recipe (whoa, talking about looking back!) and completely cracked one of the layers in half! I kid you not. Cracked it IN HALF. This is such a great cake for a 3 layer masterpiece – it really holds up, but completely moist and dense and airy all at once. And for the final product – I’m a bit impressed by this replication of the logo myself. But I guess that’s bad form to say that. Oh well, good thing this is only the internet. “Happy Holiday” … s? Only saw this now. Good old Chinese food containers! 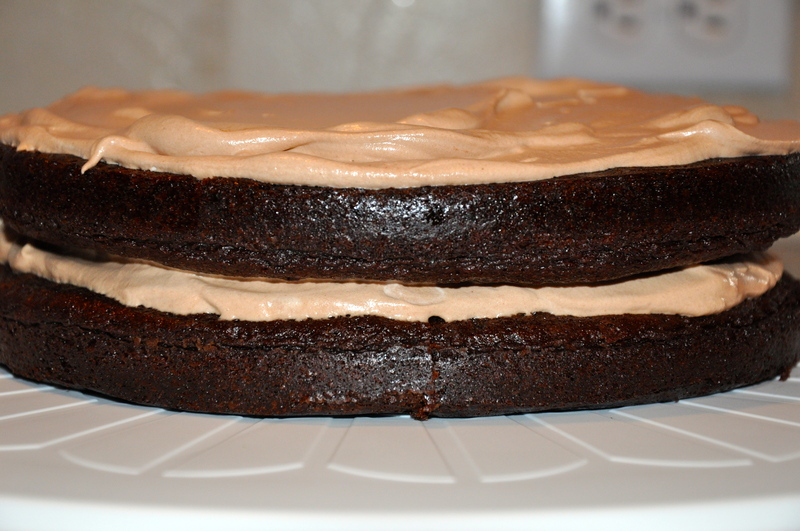 My other baking adventures are all modified repeats of recipes previously featured; some pictures and fun up next! Also, very exciting news; I had my first ‘gig’ if you will, I baked for a work party… but it wasn’t my work!! It almost felt too good to be true, getting hired to do something I love to do as a hobby, but it was fantastic! Definitely a big highlight this month! 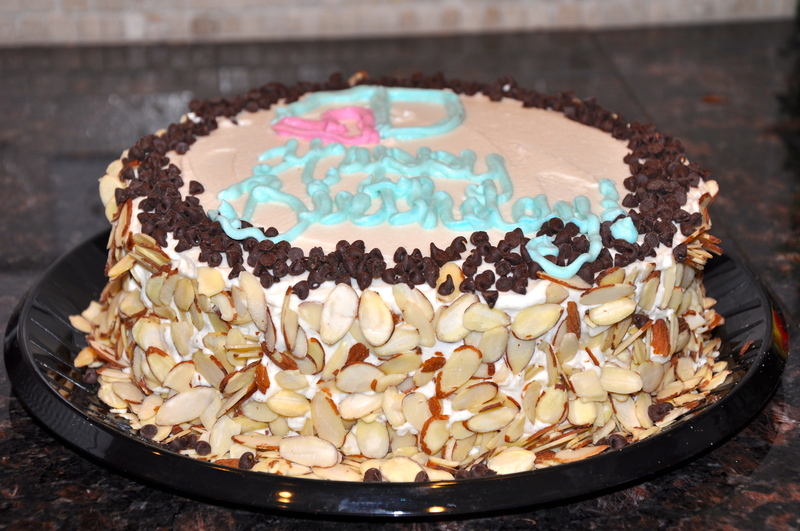 Another of my projects was a very delayed birthday celebration for my brother – Ryan’s! 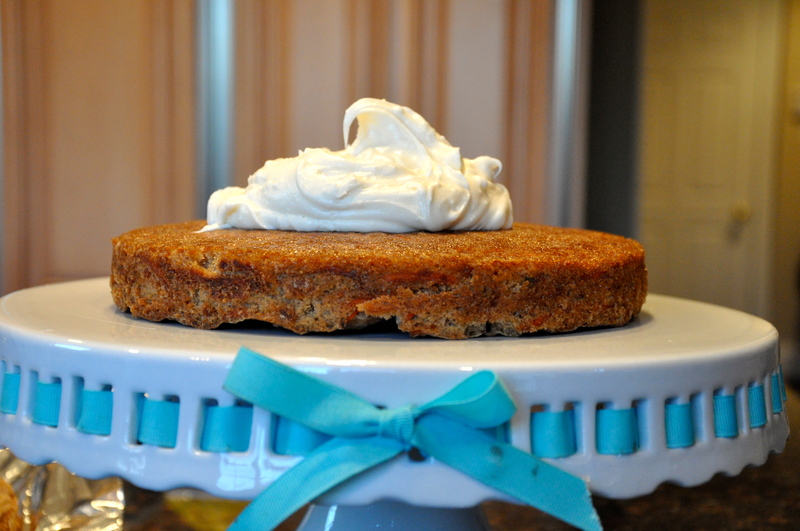 Carrot Cake! Another recipe from our very well loved recipe book with that silly copyright thing. But some pictures to check it out. 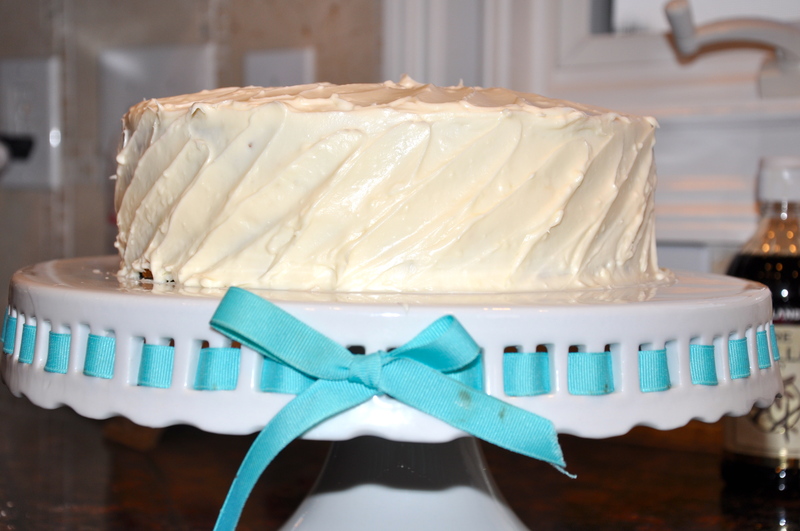 I used really wide cut carrots for this cake – and got mixed reviews; it was soft and chewy but I think I’d go with more thinly sliced carrots next time! 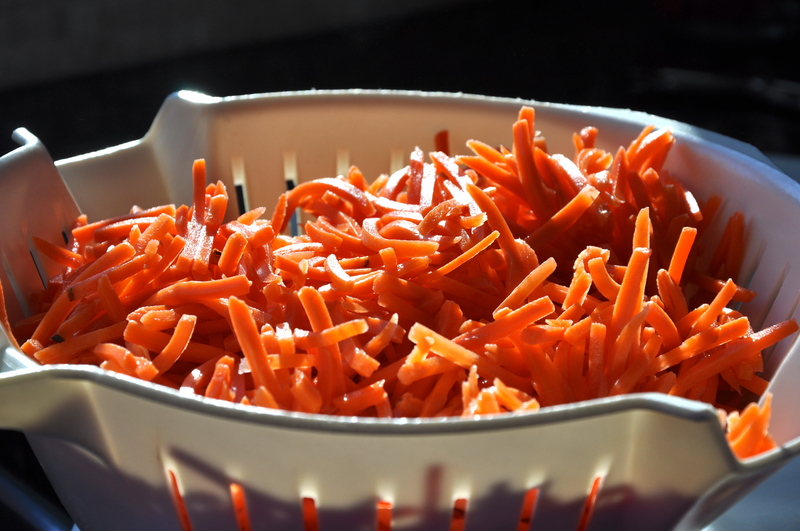 The color of these carrots – I couldn’t resist. This if the first time I’ve made a carrot cake, and I have to say the carrot-to-batter ratio was pretty disarming! 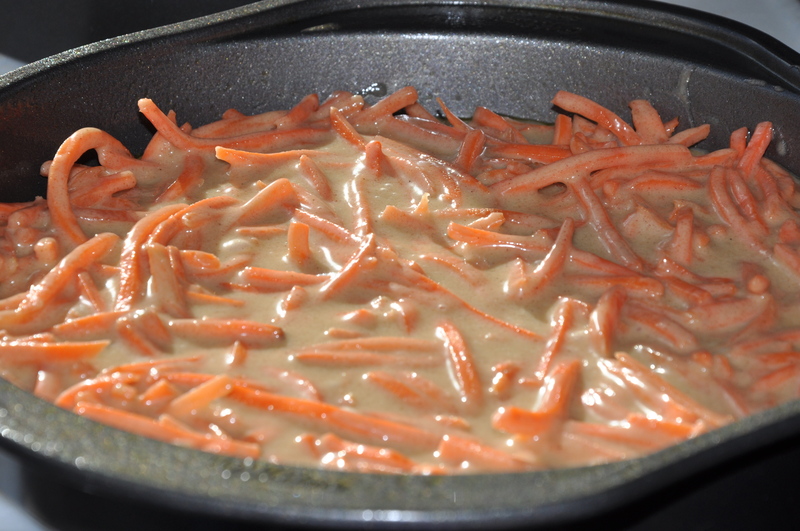 See what I mean about thick carrots? But it turned out delicious, obviously. (Just kidding, but it was really well received). Oh my goodness, I need to purchase new ribbon. Or wash this one at least. 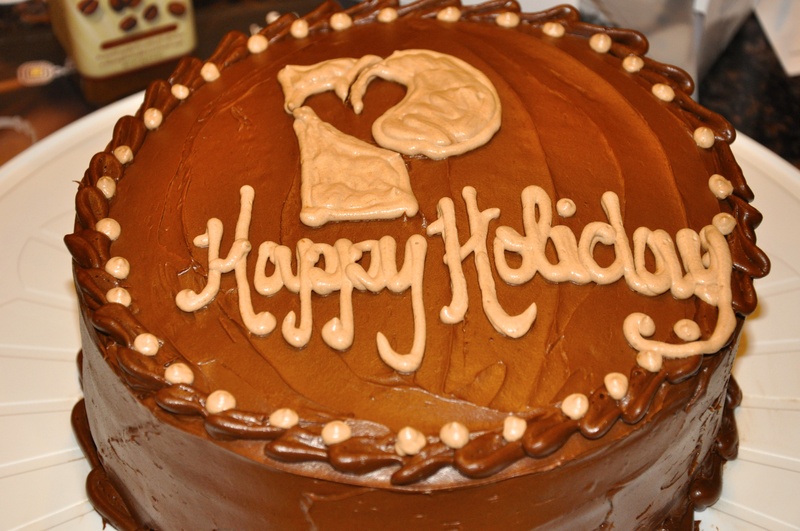 Happy Holidays and a happy and healthy New Year to all my foodies out there! 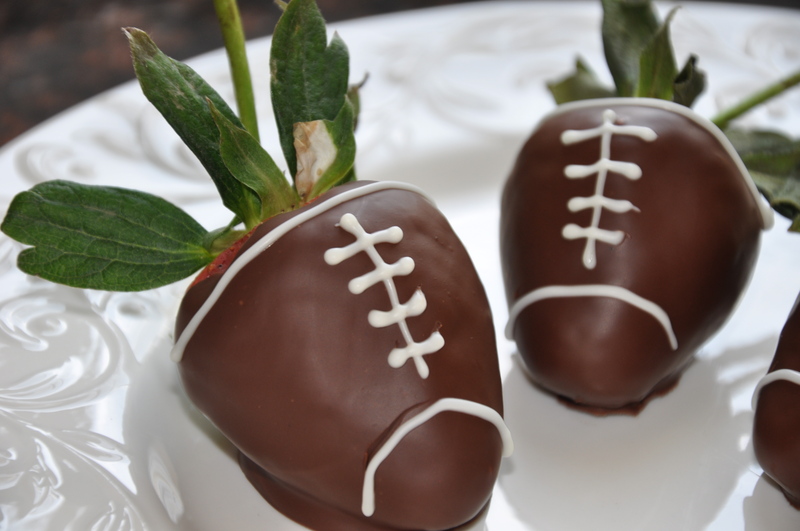 Important resolutions for me, include stepping out of my baking comfort zone, perhaps experimenting with fondant soon? Who knows! I’m always open to suggestions!